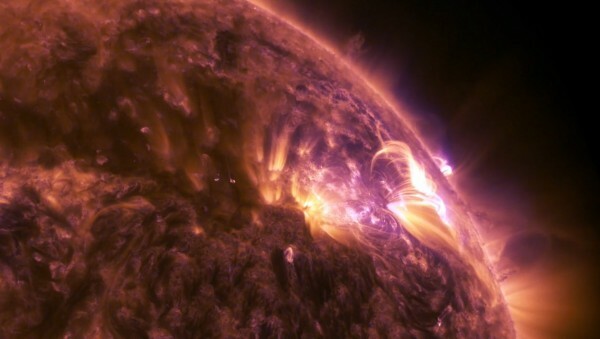 Want to see what the sun looks like up-close and in-person? NASA captured this incredible footage of the sun from the Solar Dynamics Observatory as a mid-level M6.7 solar flare happened around 8:30 p.m. ET on April 17, 2016. According to NASA, the footage was captured in several wavelengths of extreme ultraviolet light which would normally be invisible to our eyes. But the video is color-coded by the Solar Dynamics Observatory so our mortal eyes can experience the beauty. The footage from NASA is offered in several high resolution formats including 1080p, 1440p, and 2160p (4k UHD). The Ultra High Definition video can be downloaded from the NASA website in 4096 x 2160 (30fps) for viewing on Ultra HD TVs. Then, you just need a way to transfer the 2.4GB file to 4k TV. This can be accomplished using a flash drive or file sharing app. Alternatively, you can use the YouTube app on a connected Smart 4k TV to stream the video directly from NASA’s YouTube upload. Just open the app and search for “NASA 4k April 17.” Then, be sure to choose 2160p if viewing on a 4k TV.